It has been a long time since I posted a recipe on my blog. Not that I gave up blogging, or that I disappeared for no reason. I was in France for about one month and instead of enjoying my time with my family, I had to deal with the stress of my father’s health, since he had a stroke right before Christmas which left his left side paralyzed. Of course, I was devastated, in shock and could not talk about it, cook, blog, nor think about cooking until a few days ago. Of course, France was cold, grey but still a great place to be in those circumstances where everyone from family, friends, doctors, nurses were simply amazing. I usually do not post any private information about my family, because I want this blog to remain really food centric and not having people get distracted by personal stories. I know most people like to read those types of stories, they feel this way more connected to the blogger, but I feel uncomfortable about throwing my personal life out there. I don’t know why. Anyway, I just wanted to tell people who have been kind enough to follow me, and read my blog to tell them that I did not forget anyone, on the contrary, I did miss everyone I met in this amazing food blogosphere (if that’s a word). Now back to the kitchen. I rarely buy red cabbage, I mainly buy it for its color which is one of my favorite color. I thought buy using it in a soup would make the soup turn purple, I was a wrong, well not completely wrong. To get a deep red purple, you need to leave the soup rest for a couple of hours, without blending it. Otherwise, the soup gets a pinkish color, but nothing that would look like a purple. The flavor is very smooth, a little sweet due to the onions and leeks, but very hearty. I used mimi creme, which is a vegan cream but you can use regular crème fraîche, all depending if you are on a vegan mood or not and if you want to count your calories. Soupe au chou is a traditional French soup, made out of white cabbage and eaten white beans and sausage which is considered a peasant soup. This is another lighter version with a different texture. 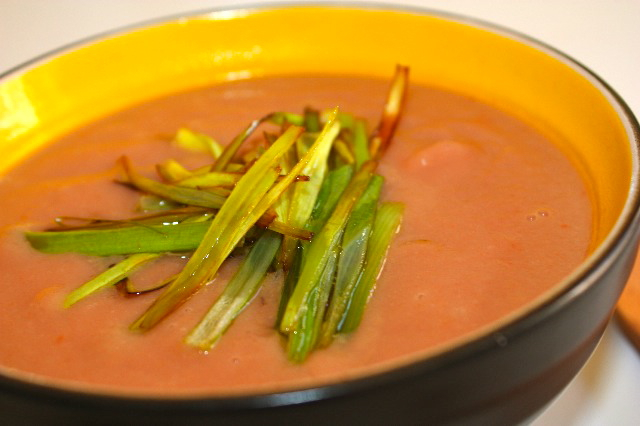 The fried leeks julienne placed on top at the end, add a wonderful flavor that finishes the soup to perfection. Do not skip on the leek, they do make a difference! small things like this make often a difference! Cook all vegetables in broth for about 15 minutes, but do not over cook them, add curry, cream salt and pepper. Fry the leeks julienne in olive oil at high heat and cook until crispy. Drain and set aside. Blend soup using an immersion blender. Serve in bowls, and divide some of the fried leeks in the center. Serve with toasted baguette. This entry was posted by silvia on February 10, 2011 at 5:45 am, and is filed under Soups, Vegan. Follow any responses to this post through RSS 2.0.You can leave a response or trackback from your own site. welcome back!it was so sad without you here…i used red cabbage only for salads,but we give me a reason to try another dishes,your soup looks and sound great! i wish your father a good recovery! Welcome back, Silvia! I had indeed noticed your absence and wondered why… now we know. So sorry! Hopefully things have improved, or at least stabilized, for your Dad. We definitely seem to same the same philosophy when it comes to blogging. I, too, avoid getting into personal stuff. Not the usual way of bloggers as you say, but for me, as for you, it’s all about the food. In any event, the soup looks warming and lovely. The alchemy of the kitchen can so often surprise us by producing unexpected colors or textures or tastes. I recently made a crème de lentilles with fois gras for some friends. No one could figure out what the soup was made of! Unsophisticated palates? Perhaps, but I must say that had I been tasting the dish for the first time, I, too, might have been stumped. I guess that’s what keeps us all interested! hey, i missed you! glad to know you’re back and are ok, but i’m sorry your father has been ill. i hope he is improving and is getting excellent care from the doctors, family, and friends. i understand how it can be difficult to leave when a loved one is ill. thank you for sharing. your soup looks so comforting for this chilly weather. i like to boil red cabbage and then cook other foods, like pasta, in the water to turn them purple. it’s a neat trick to serve friends since they wonder how you turned all the food purple naturally. This would be my first time on your site, and I must say, right off the bat you melted and humbled my heart with your words. Thank you for sharing and being vulnerable to us readers. I hope everything progresses with your dad. The soup is very delicate looking and would warm me to the bone on this very chilly day. Hope you have a great day! And I can’t wait to see more posts. When you have time of course. Welcome back, Sylvie! Sorry to hear about your struggles. Your soup looks divine and is sure to warm the heart and body! You were missed! My prayers to your family. Another great recipe! Though I’m glad to see you back, I’m sorry to hear about your father. Blogging certainly would have been the last on my mind also. I’ll be thinking of you and your family, praying for your father’s speedy recovery. Thanks for sharing with us this beautiful soup. I have been thinking about you over these past few weeks, and I’m so sad to hear about the reason for your absence. My heart goes out to you and your family. I know that this must be an especially trying time. Thank you for sharing this beautiful soup with us. As always, you are an inspiration. My prayers are with you. Wow its been way to long without you and everyone including me missed you….hope your dad is doing better and stronger everyday..its so stressful to have a parent sick. 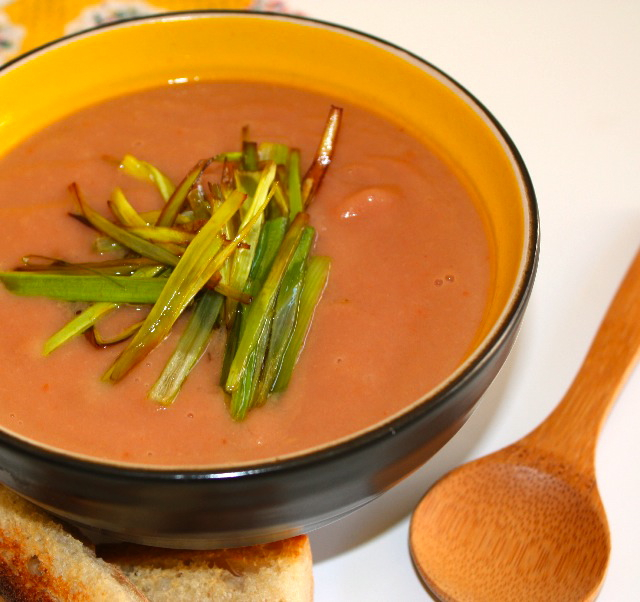 Welcome back glad to see you here again Silvia…hope you are doing fine as well… your soup is lovely, gorgeous color! You and your wonderful food were missed. Thank you for explaining your absence; I agree with you, I normally don’t enjoy too much over the top personal disclosure… somehow seems disingenuous . Hope your father is improving. Silvia, I am so sorry to hear about your father and send thoughts and prayers for him and all of you. Thank you for letting us know about what happened. The soup is gorgeous. I love the color.